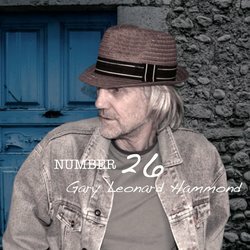 Gary Leonard Hammond was born and raised in the small country town of Gruyere in Victoria, Australia. He took piano lessons from an early age, which were curtailed at thirteen, when he had a bike accident and was hospitalised for nearly a year and lost a kidney. A few years after his recovery he left home and lived in and around the Dandenong ranges playing in various folk bands usually on piano or bass. A number of stays in a rehabilitation centre for anxiety related issues led him to begin writing songs, initially in the style of The Pogues and Eric Bogle. He wrote songs about dreamers and isolation, hopes and regrets and kept up his live performances. Two album releases "A Secret Life" (2013) and "Bone on Bone" (2016) gave him a small but discerning audience, with two of his songs charting in the Netherlands. He currently lives in Melbourne, Australia with his wife Marion and daughter Georgia. His new album is called "Number 26"
Over The Hill is a rollicking celebration of the desire for a better life. Based on folk song traditions with a chorus that one can't help but singalong with. Over The Hill is a mythical place where the grass is greener and the sun shines brighter. Who hasn't dreamt of that?